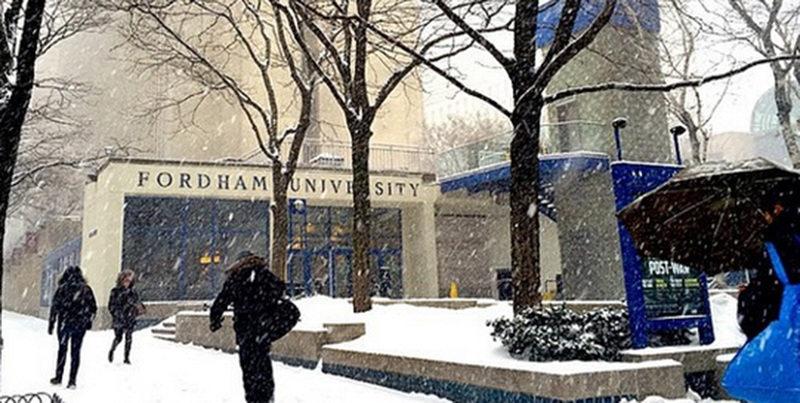 Update Wednesday, February 13 | 5:30 a.m.
Due to icy conditions north of the city, Fordham Westchester and the Calder Center will open at 11 a.m. on Wednesday, February 13. The Rose Hill and Lincoln Center campuses will open on their normal schedules. Update Tuesday, February 12 | 2:27 p.m.
Due to continued precipitation and freezing temperatures, all evening classes are cancelled for the Rose Hill and Lincoln Center campuses today, Tuesday, February 12. Ram Van service will remain suspended until 7 a.m. on Wednesday. The University will resume normal operations on Wednesday, February 13. The Men’s Basketball game against Davidson College in the Rose Hill Gymnasium will go on at 7 p.m. this evening, as scheduled. The University will reopen the Lincoln Center and Rose Hill campuses for evening classes beginning at approximately 5:30 p.m. on Tuesday (Fordham Westchester and the Calder Center will remain closed). Should evening classes be cancelled the campus community will be notified by email no later than 2 p.m. Tuesday afternoon. Most University dining facilities at Rose Hill and Lincoln Center will remain open on their regular schedules on Tuesday; dining at Fordham Westchester will be closed. The Walsh, Quinn, and Law libraries will be open as study spaces only on Tuesday. Ran Van service will end at the normally scheduled times tonight, Midnight and 1 a.m., at Rose Hill and Lincoln Center respectively, and will resume at 4:30 p.m. on Tuesday. University Health Services and Counseling and Psychological Services offices at Lincoln Center and Rose Hill will be open on their normal schedules, as will athletics facilities at both campuses. The Men’s Basketball game against Davidson College in the Rose Hill Gymnasium will go on at 7 p.m. on Tuesday, as scheduled.